For most applications the detection of ultra small gold particles in electron microscopy requires a particle enhancement procedure. Danscher’s method has always been the standard for this purpose and for a long time attempts to improve the features of Danscher’s system met with only limited success. The goal in the development of AURION R-Gent SE-EM was to create a new system with enhancement efficiency and homogeneity at least comparable to Danscher’s method, but with reduced acidity and light sensitivity. In addition, the reagents should have low viscosity for the suitability in pre-embedding immunogold labeling. 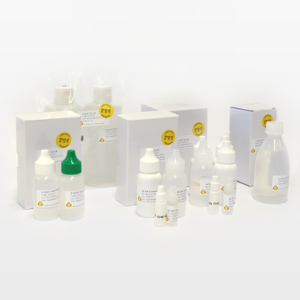 The Immunogold Silver Staining technique (IGSS) finds application both at the electron microscope and the light microscope level. In addition the technique is used to identify proteins or nucleic acids after blotting. Light microscopical and macroscopical visualization of the latent gold signal requires an enhancement system that renders a high contrast signal. Light insensitivity and negligible autonucleation are required for ease of handling and low background. AURION R-Gent SE-LM is a two-component reagent that meets these requirements. Aurion’s Enhancement Conditioning Solution (ECS) is a concentrate that requires a 10x dilution with distilled grade water before use. It helps optimise enhancement by conditioning specimens labelled with (ultra small) gold conjugates before the silver enhancement procedure using Aurion R-Gent SE-EM. Aurion ECS is a prerequisite to condition enhanced specimens for a second incubation series in double labelling experiments (Yi et al, 2001, Journal of Histochemistry and Cytochemistry 49(3): 279-283). More on ECS – Enhancement Conditioning Solution….